I recently realized that while I have been enjoying working with the enhanced LACP feature provided with the vSphere Distributed Switch (VDS) version 5.5, I’ve never actually taken any time to document the process. For those who want to create a Link Aggregation Group (LAG) in 5.5, or have already been through the process in 5.1 or older, I will share that the process is incredibly different. While there are a few more steps in the process and numerous wizards to walk through, the end results are spectacular. I think you’ll find the resulting LAG much more transparent and flexible than the days of yore. But, you’ll have to be the judge – so let’s dig in! Note: You can find my opinions on why you would and would not want to create a LAG, too. First things first. If you haven’t taken the time to upgrade your VDS to 5.5, we’ll need to get that squared away. 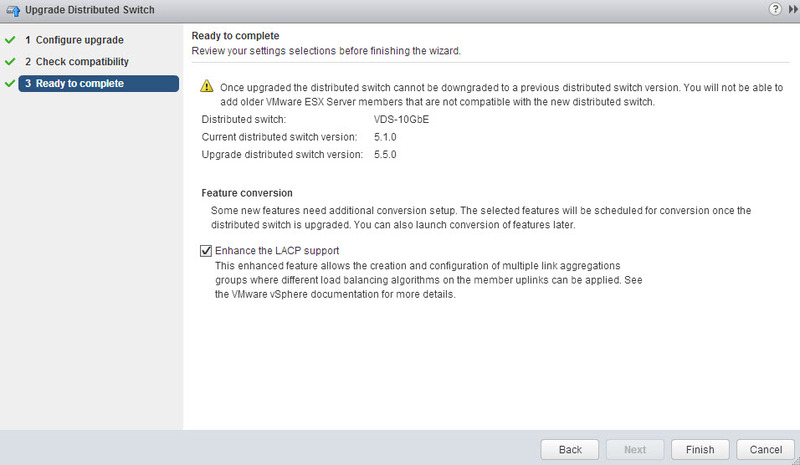 I’ll walk through the process in my lab with an existing VDS version 5.1 that already has LACP enabled. Start by navigating to VDS > Manage > Settings and verifying your properties. Make sure there are no errors on the switch, the hosts attached are healthy, and you have a backup (just in case). This VDS is still running 5.1 – upgrade time! The VDS I’m upgrading already uses LACP and needs to undergo feature conversion. You may not see this step if you don’t have LACP enabled. A final prompt in the wizard will confirm that I wish to include enhanced LACP support on my VDS. Check the box and click finish. It’s time to get schooled on enhanced LACP support by another wizard. It’s nifty that VMware has taken the time to educate folks on what the upgrade means and how to configure the new options. Once you’ve assimilated all of the magical new toys at your disposal, it’s time to run a validation test for port group accessibility, LACP configuration, uplink teaming policy, host accessibility, and host connectivity. The wizard is picky about making sure you are really, really ready for this upgrade. So, don’t slack (and take a backup)! The completion screen gives you a recap that covers the LAG creation. I especially like the “your LACP basic support is ready to be enhanced” part. I read it in the voice of the HAL 9000. Didn’t you? Note: Did you backup your VDS? Disaster loves the unprepared. Any chance you will make a video on this?, using the HP v1910 switch? I can do that, expect it out on my YouTube channel in a few days. What is your final though on LACP use in production envrnt ? Great video and a clear explanation of all the options. Thanks Chris! Has anyone done a performance any benchmarks comparing the performance of standard vSwitches versus distributed vSwitches (both with and without many features that may slow it down)? As more features are added, it seems logical that performance will suffer. Obviously faster processors will help, but I wonder how CPU-distributed the functions are.